Doctors and patients both agree that dental implants are the tooth replacement method of choice all over the world. They are a permanent solution to missing teeth that have been designed to incorporate themselves into your jawbone for life, whether they’re replacing one tooth, several teeth, or all of them! Every dental situation, or case, is different—and there are different ways to incorporate an implant into your smile. All-on-4® or Teeth in a Day replace missing teeth in a single visit. 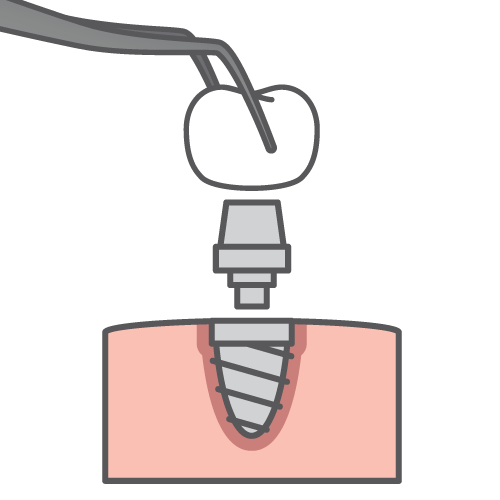 Most implants take two visits: one for implant post placement and one to complete the implant with a tooth-colored crown. Healing time between placement and restoration varies. Implants stabilize dental appliances in surrounding teeth. With good oral hygiene, implants will be permanent. An implant completes your smile like it was always there. Only your dentist knows for sure! One of the reasons implants are so popular is that they don’t just replace teeth visually–they incorporate themselves into the mouth and prevent painful, damaging bone loss that can result in a face that appears “sunken-in”. If cared for properly (you still have to brush and floss! ), implants can last a lifetime without the need for intermittent replacement or inconvenient repairs. Implants are also unbreakable and easier to care for than removable artificial teeth. Today’s implants are fitted to the mouth for bridges, partials, or a full set of dentures for a permanent solution to missing teeth. Implant-supported dentures will require satisfactory gum health. Implant-supported dentures surely lock into place. Eating, speaking, singing, and smooching are much more fun! These dentures won’t be sitting in a glass by the bed. These are not your grandma’s dentures! They don’t fall out, fit poorly, cause discomfort, shift, rock, or slip. You care for them just as you would your natural teeth. You can eat and drink whatever you like (within reason)! You’ll never want to hide your smile again! You might feel like a kid who just got their braces off and can’t stop grinning. We can’t wait to smile with you, and to hear how your life has improved, from enjoying your favorite foods, to your oral hygiene routines, to your confidence level. Secure your smile with the leading tooth replacement solution. If you’re interested in implant options, get in touch today! All-on-4® is an implant system that can replace an entire upper or lower arch of your teeth in one day. As of 2016, 100,000 people had received All-on-4 treatments. All-on-4 requires favorable gum health, as do all implants. All-on-4 is especially effective for patients with few or no teeth. All-on-4® and Teeth in a Day are two different solutions. 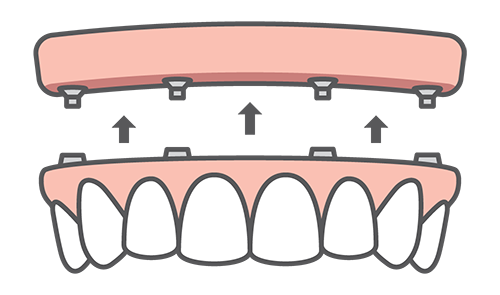 All-on-4 uses the minimum number of implants (4) to replace the maximum number of teeth (a full arch). The secret to All-on-4 is the angle at which the back implants are placed, allowing them to support more teeth with fewer implants. This means faster healing and a less expensive treatment plan, and we can fix you with a set of healing teeth the same day implants are placed. Teeth in a Day is very similar to the All-on-4 treatment method, but may also involve tooth extractions the same day, and may involve a single tooth, multiple teeth, or a full arch. Teeth in a Day may use 4-6 dental implants to stabilize a full arch of teeth that can be fixed in place the same day. This first set of teeth is not the final product however, but will be worn for several months while the implants heal, before we can secure your permanent teeth. Hybridge® is a practical, cost-effective implant solution with three methods to choose from–we’ll help you decide! Full Arch replaces up to 12 teeth with 5-6 implants. Express includes temporary teeth while you heal. Overdenture snaps onto (at least) two implants. Bring back your smile & take back your life. With the Hybridge implant system, you don’t need to go without teeth. Whenever appropriate, temporary Hybridge restorations will be supplied so no one needs to go without teeth. A Hybridge Full Arch procedure can usually be completed in 5-16 weeks, though individual cases may vary. Hybridge Express temporary teeth keep you comfortable while your jaw heals, while the Hybridge Overdenture snaps on a minimum of two implants to offer a more secure solution than prosthetic dentures that is less expensive than the Hybridge Full Arch. Interested in a permanent solution for missing teeth? Let us help you complete your smile!